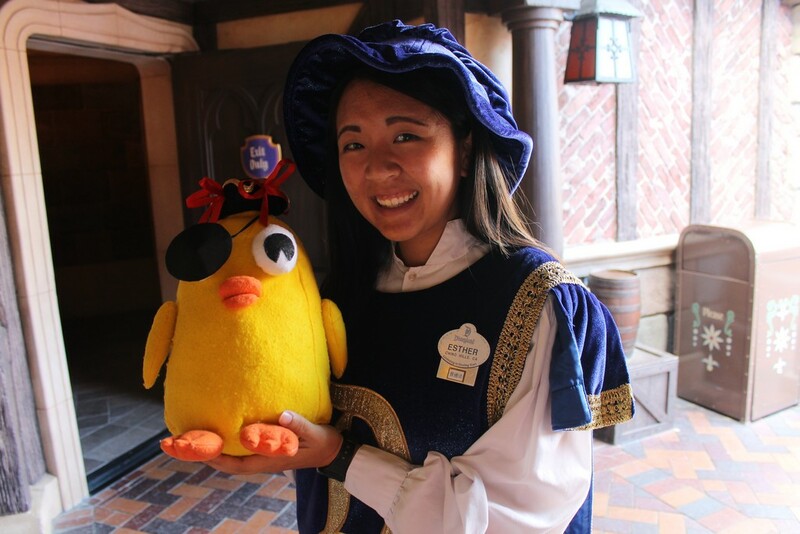 In October 2015, Ducky Momo visited Disneyland during Halloween Time again! And this time he wore a costume! Ducky Momo dressed like a pirate. 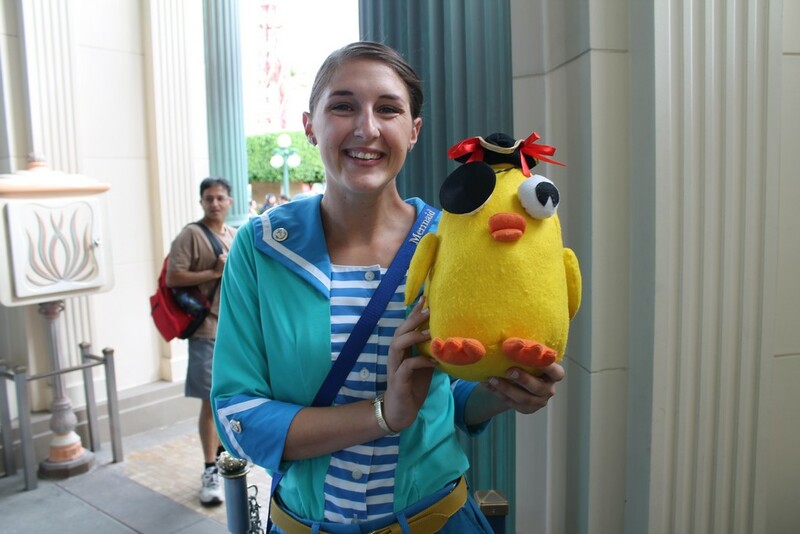 My Ducky Momo backpack ALSO dressed like a pirate! I myself went as Klimpaloon for Mickey’s Halloween party. Since the Phineas and Ferb show has, sadly, ended, there were not nearly as many young cries of “Ducky Momo!” as we walked through the park. 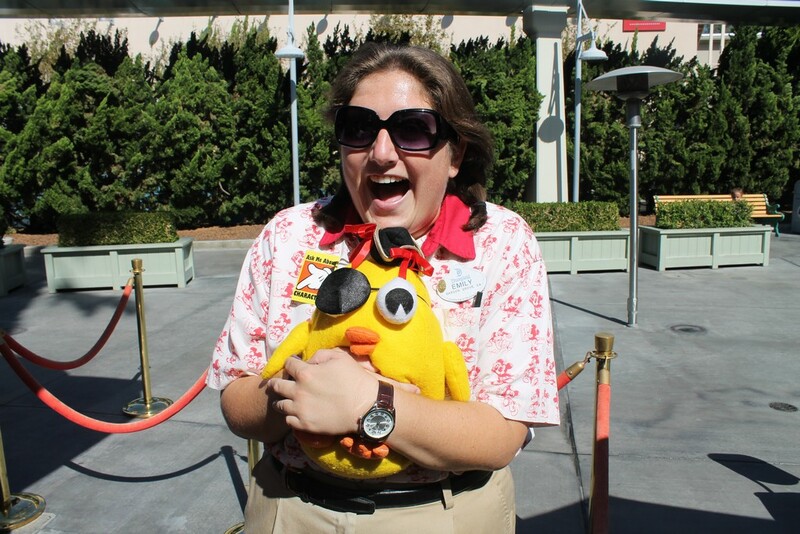 However, there were still a decent amount, and more people than ever wanted to be photographed with Ducky Momo. We visited fewer meet-and-greets this year however. 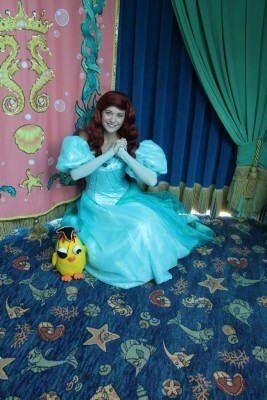 The first person to recognize Ducky Momo was this lovely young sailor lass at Ariel’s Undersea Adventure. My daughter loves the Redwood Creek Challenge Trail. We had never actually met Dug before. He was super awesome! And so soft and cuddly! 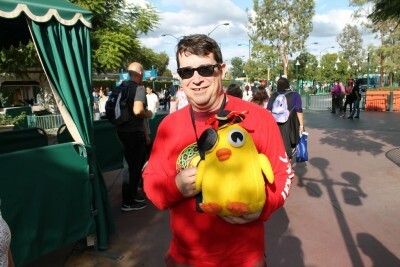 This gentleman recognized Ducky Momo at the security checkpoint before we even got to the parks! Being socially inept, I of course never think to ask people’s names. 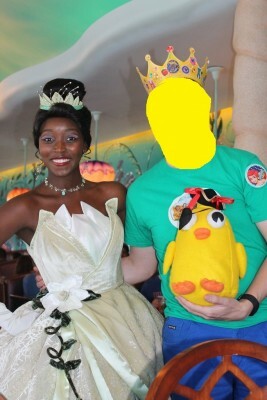 I salute you, Ducky Momo Aficionado! We’d met Jasmine before during Princess things, but never Aladdin or Genie. 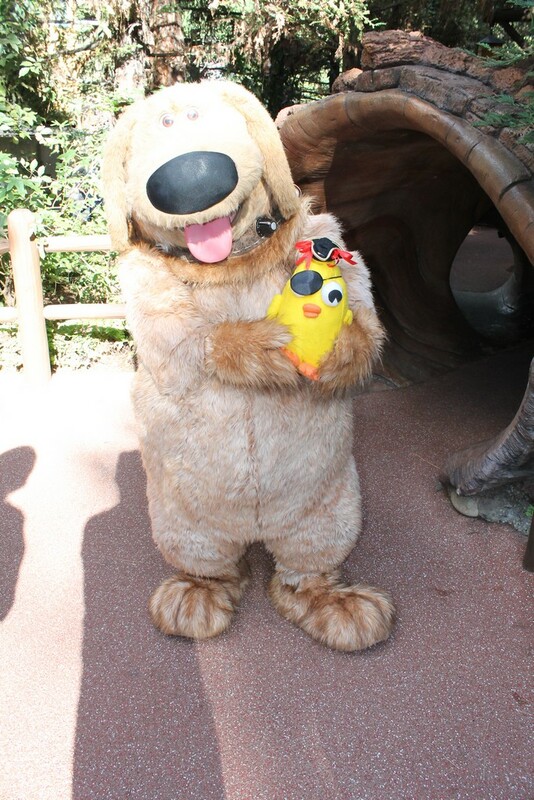 I told Genie that Ducky Momo is “your very best friend” and so he had a lot in common with him, since his theme song is “you ain’t never had a friend like me.” They bonded. This charming courtier, known throughout the kingdoms as Esther, we met at the Royal Hall. 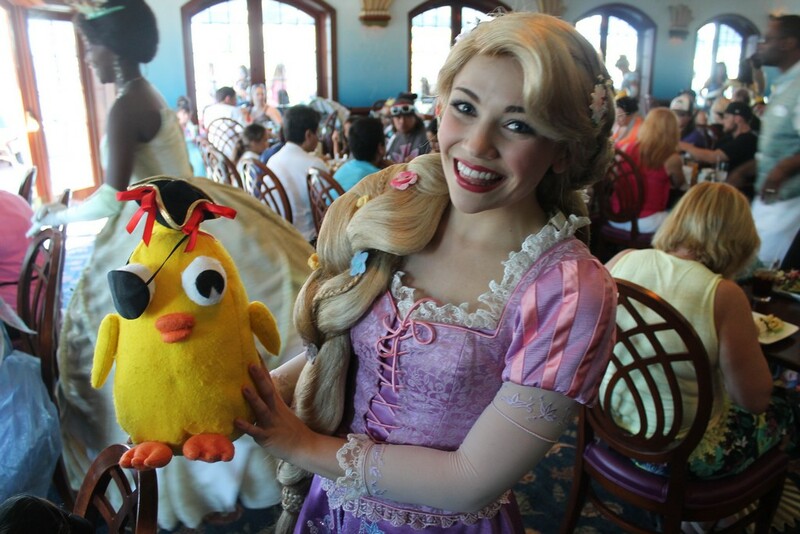 She was thrilled to meet Ducky Momo, although perhaps not quite so thrilled to have her picture taken. 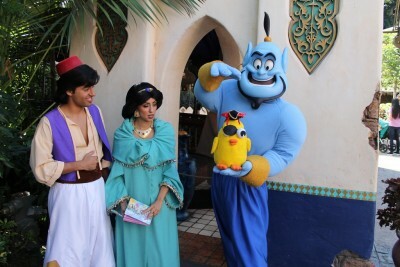 The meet-and-greet characters at Disney are of course signing up to have their photos taken and posted online. For everyone else, I always ask, “Do you want a picture with Ducky Momo, posted on duckymomo.net?”. So far everyone says yes! Peter and Wendy and Captain Hook were by the Columbia. I really wanted to meet Wendy. They told us they would be leaving soon and replaced by someone else… noooo… but we managed to be among the very last to see them before they left. Captain Hook signed my autograph book, I told him sorry about the Fairy pen, since I know he doesn’t like fairies… he was pleased that Ducky Momo was also a pirate. 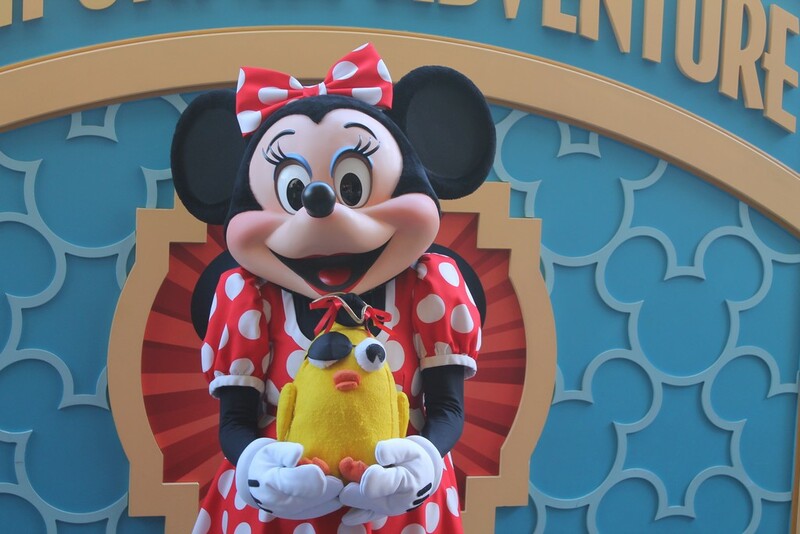 He started to lift Ducky Momo’s eyepatch and I shouted “Don’t look at his eyeball!! !” and Hook almost jumped a foot in the air in surprise at my outburst. 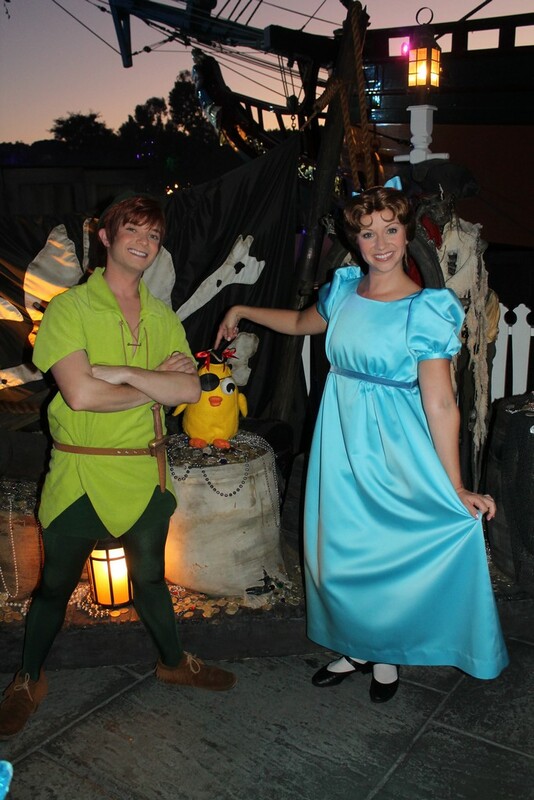 We got a Hook picture last time so this time we did Peter and Wendy, although they refused to hold Ducky Momo but did point at him. The replacement character for Peter/Wendy/Hook was Captain Jack Sparrow. I am so glad we got to meet Wendy instead. This exuberant young helper of Minnie Mouse, Emily by name, was delighted to meet Ducky Momo as we waited to see Minnie. We were hoping for Stitch, but we like Minnie too. Minnie and Ducky Momo are old friends by now. The alternate character was Daisy Duck, who I’d like to have met, but we could only wait in the line once, it was a special thing for Disney Visa holders. It was a hot day and Olaf had to take a break to re-chill himself, but then came back out and gave us a nice warm hug. He clop-clops when he walks though! Ariel didn’t hold Ducky Momo. I’m not sure why I find this so offensive… I need to let it go I suppose. Rapunzel at Ariel’s Grotto was very friendly and loved Ducky Momo. 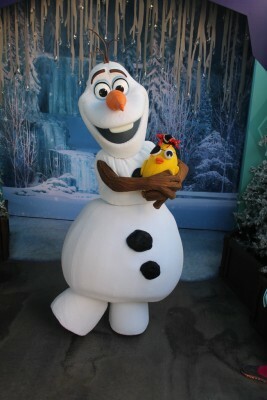 Finally, for the first time, we got to meet Tiana! So beautiful. So charming. So unwilling to hold Ducky Momo or even pose with him, unless I was in the photo as well. I should have put Ducky Momo in front of my face, so as to not have to do this tacky MS Paint edit. I just don’t like my picture being on the Internet. I realize I’m in the tinfoil hat wearing minority. I even post other people’s photos online! But always with their permission of course. Silvermist! We were in line for Buzz Lightyear’s Astro Blasters the day before and peered through the stalks to see Pixie Hollow and it was Silvermist! And it was also 1 minute to closing time for Pixie Hollow! So we came the next day and we got to meet her! She’s my daughter’s favourite fairy and we had never met her before. We met Iridessa, Periwinkle, then Iridessa again. Now we juts need to keep going to Disneyland until we have met Rosetta and Fawn as well. I doubt Vidia ever shows up. Silvermist was very friendly. 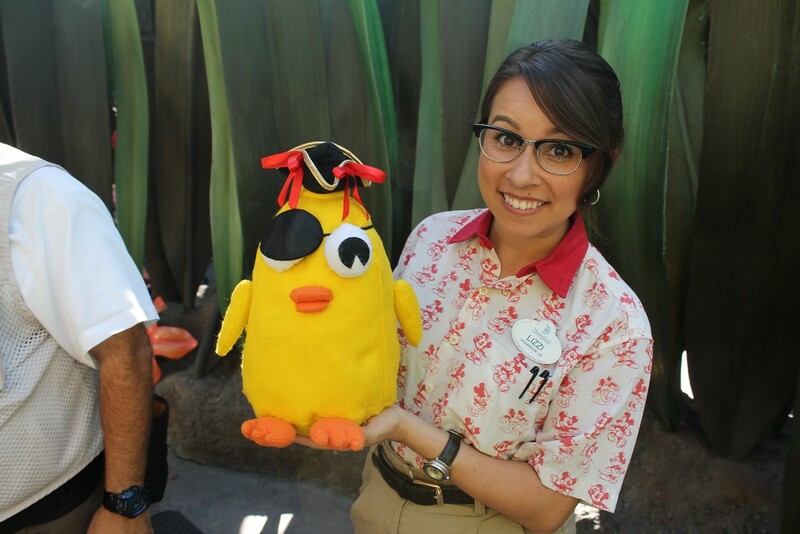 I made sure she knew Ducky Momo wasn’t a real pirate, just wearing a Halloween costume. I needn’t have worried. All the questions were easy-peasy, like who is in charge of the Tinkers (Fairy Mary) and what is her sister’s name (Periwinkle). 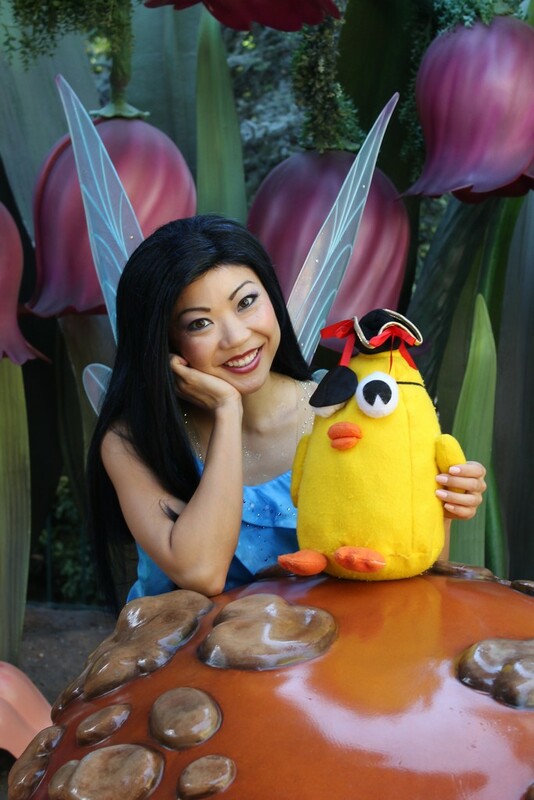 Tinker Bell is always a lot of fun and she loved Ducky Momo and I did tell her he wasn’t a real pirate and she was relieved at that. 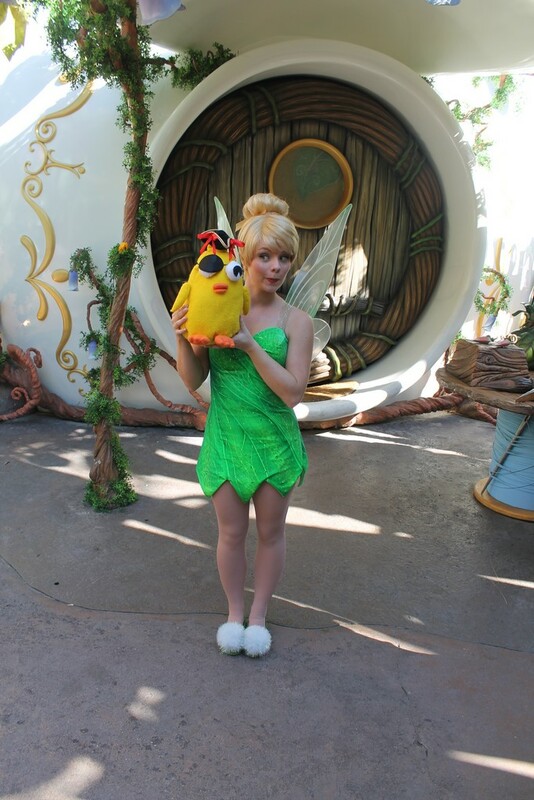 And finally Lizzi the delightful fairy friend at Pixie Hollow also recognized the Momosity and desired a photo. I told everyone to check back in two weeks, I think it has only been a few days past that.